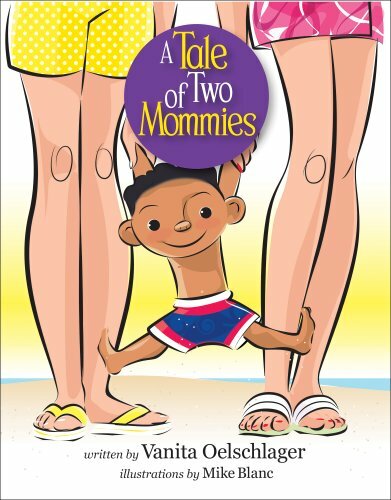 A Tale of Two Mommies (2011), written by Vanita Oelschlager and illustrated by Mike Blanc, is an affirming story about a little boy and his two moms. Three small, racially diverse children enjoy a day at the beach. One of the children, a little boy, has tawny beige skin, another is a girl with suntanned skin and red hair, the boy with two mommies has medium brown skin, curly-hair, and big brown eyes. The two moms’ faces are never shown but they both have pale skin with pink undertones. The little boy with two moms is bombarded with excited questions from his friends who are curious about what activities his momma does with him and what activities his mommy does with him. He answers their sometimes very silly questions with ease, demonstrating that his moms have all the important stuff like cake baking and boo-boo kissing covered. A Tale of Two Mommies is a fun book. The colors are bright and sunny like the day at the beach the characters are enjoying. It’s an accessible book with a clever lyricism that makes it fun to read aloud. It will make a solid addition to family libraries of very young readers who are sure to giggle along with the characters as they find answers to important questions like which mom is the best kite flying partner. I accessed a review copy through NetGalley. This review is part of my “Snapshots of LGBTQ Kid Lit” project. I’m working on a book, The New Queer Children’s Literature: Exploring the Principles and Politics of LGBTQ* Children’s Picture Books, which is under contract with the University Press of Mississippi. Part of my research is identifying and interpreting English-language children’s picture books with LGBTQ* content published in the US and Canada between 1979 and 2019. Follow my blog to follow my journey!